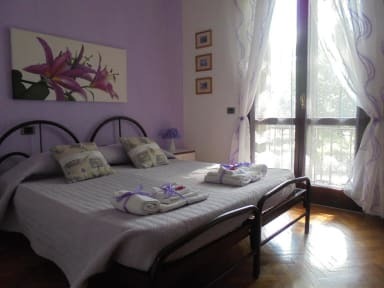 Verona Bottego Guest House i Verona, Italien : Boka nu! In case of no show I want total payment if the Guest not send email no show 3 weeks prior to arrival. 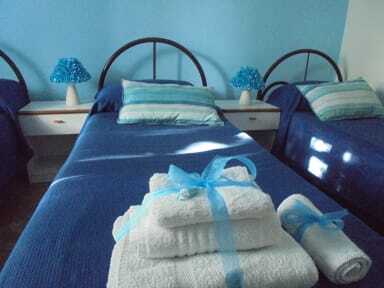 All is included in our contract B & B ed Reglement. Payment only cash (no credit cards) 70% at arrival with 30% of money in advance at booking. Large apartment, located opposite the Scaliger TENNIS CLUB, 400 mt. Park from the Walls, 500 mt. Piazza San Zeno, 650 mt. the Municipal Swimming Pool, 1.5 km from Castelvecchio, at 1.6 km from Hospital Borgo Trento, 1.8 km from the Arena (Piazza Bra), to 1.9 km from the train station, 4 km from the fairgrounds. It offers six bedrooms, one of which is occupied by service personnel, two and three by the owner - a quadruple, a triple and a double - for the guests, with three bathrooms, living room, TV room and large balcony. Payment only in cash upon bookings at the arrival. Breakfast 7.5 euro per person. Check in from 13.00 till 00.00 pm. For late arrival please get in touch in advance with the property in order to organise your stay.